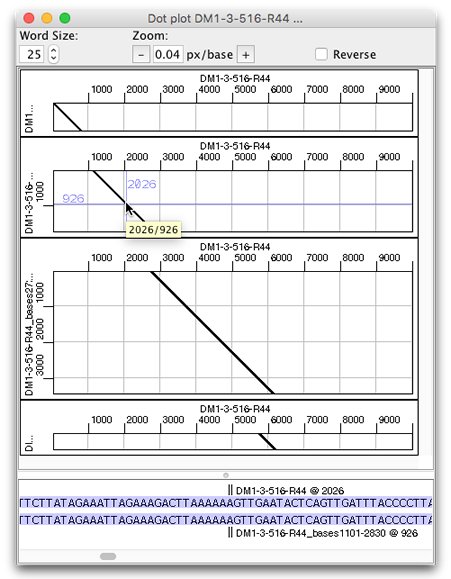 CodonCode Aligner version 8.0 introduces functionality for dot plots, clustering and identifying sequences, amino acid based alignments, and much more. Please note that CodonCode Aligner 8 requires a new license key. Version 8 is a free upgrade for all users with a current update and support agreement as of March 08, 2018. Other customers can purchase an upgrade to version 8. The new functionality to create dot plots in CodonCode Aligner 8.0 allows you to quickly compare sequences for similarity and check for overlap. Special about dot plots in Aligner is that you can compare several sequences at once. If multiple sequences are used to create the dot plot, you can choose the vertical and horizontal sequences. Clicking in a dot plot will bring up the two sequences at that position in the alignment panel at the bottom of the dot plot. The blue background for matching bases makes it possible to quickly see which bases would align. The dot plot is zoomable and can be printed. It also allows you to include the reverse sequence and to change the comparison word size. Newly added to Aligner 8.0 is the ability to cluster nearly identical sequences, an analysis step frequently used in metagenomics. Aligner's default clustering algorithm can create larger clusters than other programs by carefully selecting optimal "cluster center sequences". The new "Identify Sequences" function in CodonCode Aligner is intended for metagenomics projects, for example to identify species in an environmental sample by comparing 18S RNA sequences against databases like the SILVA database. Identification results can be hierarchically summarized by taxonomy. Aligner 8.0 adds the functionality to create alignments based on amino acid translations using the program MACSE. MACSE accounts for the occurrence of premature stop-codons and frameshifts during the alignment. Alignments of coding regions with MACSE often have better placements of gaps compared to alignments created by Clustal or Muscle. New menu items for "Align with Clustal" and "Align with Muscle"
Expand and collapse all folders: Extend or close all folders in the project view with the click of a button or using the popup menu. Create new folder when moving sequences: Create a new folder directly from the "Move to" dialog when moving sequences. Close all but the active window: Close all but the active window with a single click. New "Import Subset" option: Allows to filter subsets during import by sequence, name, or comment content. Better gaps in translations: Gaps are now shown differently than non-translatable bases (e.g. Ns). CodonCode Aligner 8.0 is compatible with Windows 10 and OS X 10.13 (High Sierra). Interested? Watch the Flash movie showing the new features of CodonCode Aligner 8.0.1.